Yes, Amazon has reviews for different products mixed. They have the R2 DVD reviews mixed in with the UK, region free, BR set. Amazon US rarely gets "region free" products listed properly. Big Bang Theory is from Warner Brothers. All of their BR product is region free. So is BR from Paramount and Disney. If any of those 3 have region locked BR product I've not yet seen it. The BR set at Amazon UK did go up. It's now ~$83 US shipped. Thanks bob. I'll keep a watch on this one and order once it drops again. btw, it was about $72 on amazon.com. well, amazon.com repriced TBBT at $70, less than before, so I went on ahead. I had enough reward points on my card for it to be $59. Hard to beat that one! Happy to have nearly the whole thing finally and on blu ray! Not worried so much about the really low price on warnerbros.co.uk. there's a misspelling there! big BANGE theory!?! and I searched for the right spelling and it came up the same as $68. I bet with shipping to the US it's even higher for there and amazon uk! Will report back on how they work but it does say all region even though it also says PAL which is wrong. rebought The Simpsons season 4. (long story version follows) Was just talking about my All in the family season 6 having a rotten disc. By chance I wanted to watch Buffy the vamp slayer, one I've been so slow on! Only on season 2. I decided to check all the discs from all the seasons to make sure there's nothing wrong like rotten discs or blemishes, which have ruined a few! I think that's cases doing that. All was well, also with the spinoff Angel. All my seasons of 24 were fine. etc etc. But then I get to simpsons, I'm also slow. ONly on season 2 as well. I had a lot of discs that were sticky around the outside edges and the center area on the flat side of each side!! One disc had a small rotten place, like the huge place on All in the Family. brand new disc ruined. I've had problems with I Dream of Jeannie, Bewitched, Leave it to Beaver and others with blemishes. I have quite a few others to open and check. scary stuff. Correction: the set from warnerbros uk for 51.99 is the DVD region 2 set. So that blu ray would have to be much more. I think I got a very good deal. plus I should have it within a week and half. I hate binging stuff but... I stopped on season 6 when Howie gets back from space and can't wait to get back started because I want to get to the end and then go back to season 1 and start again !! and can't wait to get back started because I want to get to the end and then go back to season 1 and start again !! Jeff Flugel and Radioman970 like this. 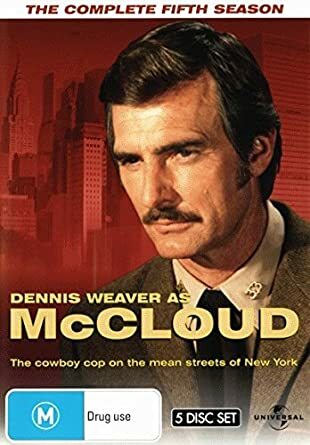 Kicking myself for not getting these McCloud sets when they were still easily available from Europe and/or Australia. Such a fun show. Found a new copy of S5 on ebay...not cheap (around $29 for the set), but I'll take it. Found S4 as well...will likely pick that up soon, too. No luck on S3, 6 or 7, though. morasp, Radioman970 and Flashgear like this. TBBT showed up Tuesday. They look and play fine!! One of my favorite deals.. so much fun! Johnny Angell, Flashgear and Jeff Flugel like this. Got The Walton's season three, and The Guns of Will Sonnett the complete series. Doug Wallen, morasp, Radioman970 and 3 others like this. Ordered Season 2 of High Chapperral more Uncle Buck ! I enjoy this series most during the first season. I didn't want to pay too much for something that may never be played all the way through. I felt this was an acceptable compromise since I now have the episodes even though altered from the original OAR. I viewed the first disc and I can live with these transfers. They suit my purpose. Darby67, bmasters9, Flashgear and 1 other person like this. Lost in Space - Complete series in WS on DVD. Couldn't pass up the very cheap price ($19.96 @ WM) in spite of owning a copy of the remastered Complete Series BR set (in glorious OAR). I didn't buy one but wanted to... wally has Here's Lucy complete, with each season in it's own case, for $70. will buy in the future. Susan Nunes_329977, morasp, Jeff Flugel and 1 other person like this. This is also on Hulu and it looks great. Nice clean images. yeah that's kind of neat. I saw it today and thought it was $30. I'm happy with the blus though.. the commentary on Mr Nobody is one of my favorites of all time. So far the others they've talk during aren't quite up to it. Have Gun - Will Travel Complete Series from WalMart. Inspired by Josh's thread concerning 30 minute wasterns on dvd. Jeff Flugel, Darby67, Radioman970 and 6 others like this. Jeff Flugel, morasp and bmasters9 like this.